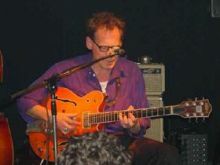 Arthur Ebeling is known in Holland as one of the most authentic, awesome and all around rhythm 'n blues guitarists and singer-songwriters. Appreciated for his intricate and divers techniques, conveys an obvious love for his Gretsch-guitar, music and performing. Arthur takes his audience on a journey of unending surprise and delights.